30 Commonwealth is located on the south side of Commonwealth, between Arlington and Berkeley, with 28 Commonwealth to the east and 32 Commonwealth to the west. Eight of the nine lots where 20-36 Commonwealth were built were sold by Samuel Hooper on July 1 or 2 in 1860 (the ninth lot, for 36 Commonwealth, also was sold at that time but was not conveyed by deed until July of 1862). 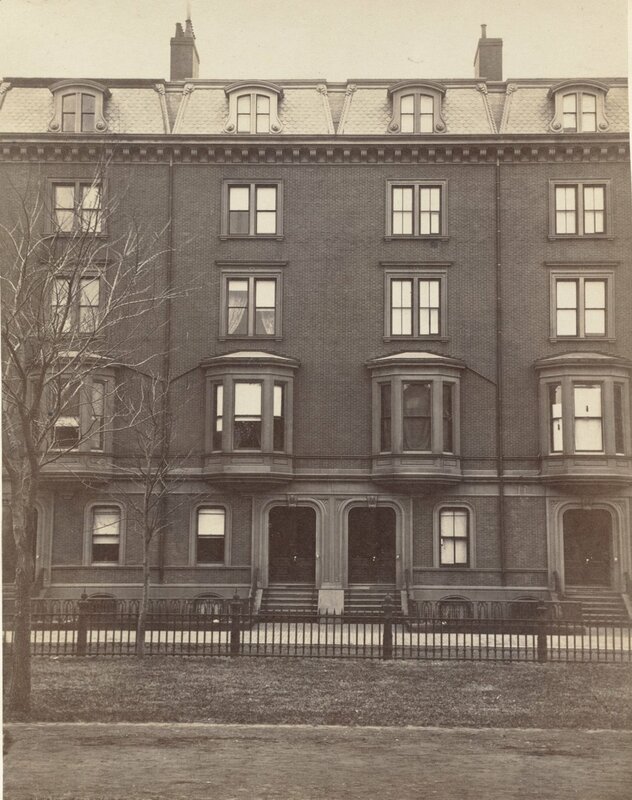 The buyers contracted with Charles Woodbury and Lemuel Miles Standish, masons, and Jonas Fitch, carpenter and builder, to construct the houses to the designs of Gridley J. F. Bryant and Arthur Gilman. Based on the architectural drawings for 22 Commonwealth, cited by Bunting, and three building contracts filed with the Suffolk County deeds for 26, 28, and 34 Commonwealth, the contracts were executed on July 7, 1860, and specified a deadline for completion of the houses by August 1, 1861. Click here for an index to the deeds for 30 Commonwealth. Jonas Fitch, who built the nine houses with Lemuel Miles Standish and Charles Woodbury, purchased the lot where 30 Commonwealth was built, and he and his wife, Catherine (Blodgett) Fitch, made it their home. They previously had lived at 13 Edinburgh. They also maintained a home in Pepperell, Massachusetts. Lemuel Miles Standish and his wife, Olive L. (Nutter) Standish, lived at 32 Commonwealth. Charles Woodbury and his wife, Relief (Ball) Woodbury, lived at 91 Pinckney, but then built a new home at 16 Commonwealth ca. 1864. The Fitches’ son-in-law and daughter, John Wallace and Ann (Fitch) Wallace, lived with them. He was a boot and shoe merchant in the 1870s, a dry goods merchant by 1880, and a real estate broker by 1885. Jonas Fitch died in February of 1882. Catherine Fitch and the Wallaces continued to live at 30 Commonwealth until her death in March of 1892. After her death, the Wallaces moved to the Hotel Vendôme. On July 5, 1892, 30 Commonwealth was acquired from the estate of Jonas Fitch attorney William Warren Vaughan. He and his wife, Ellen Twisleton (Parkman) Vaughan, lived at 354 Beacon. On November 1, 1892, 30 Commonwealth was acquired from William Vaughan by his brother-in-law, Henry Parkman. He and his wife, Mary Frances (Parker) Parkman, made it their home. They previously had lived at 56 Chestnut. Henry Parkman was an attorney and served first as treasurer and then president of the Provident Institution for Savings. He died in June of 1924. 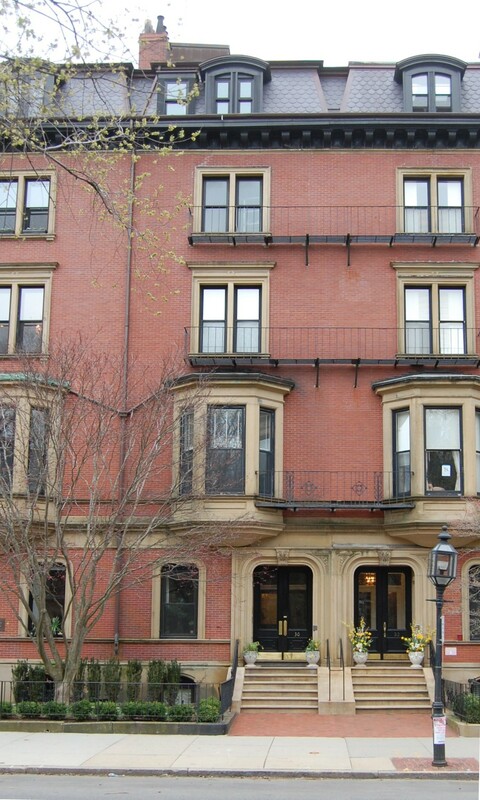 Mary Frances Parkman continued to live at 30 Commonwealth until her death in July of 1942. She also maintained a home in Northeast Harbor, Maine. On December 11, 1942, 30 Commonwealth was acquired from the estate of Henry Parkman by real estate dealer Ray C. Johnson. On December 24, 1942, 30 Commonwealth was acquired from Ray C. Johnson by Benjamin Franklin Ross and his wife, Tanyia (Tanka) (Anacki) Ross. They previously had lived in Cambridge. by 1945, they had moved to 50 Hereford as lodgers. On September 5, 1944, 30 Commonwealth was acquired from Benjamin and Tanyia Ross by New England Motors, Inc. Benjamin Ross was treasurer of the company and his brother-in-law, Anthony Anacki, was corporate clerk. 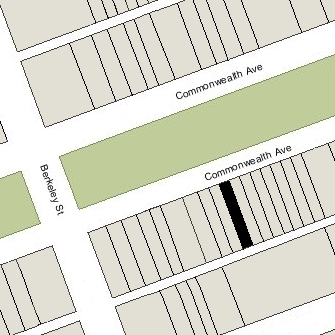 30 Commonwealth was shown as vacant in the 1943 City Directory. On October 4, 1944, 30 Commonwealth was acquired from New England Motors, Inc., by Ellwood B. Allen and his wife, Eva Helterline (Hilton) Allen. They lived in Belmont. Ellwood and Eva Allen were real estate developers and interior decorators. In the late 1940s, they built a recording studio in the basement of their home in Belmont and established the “Radax” record label, which featured local musicians. 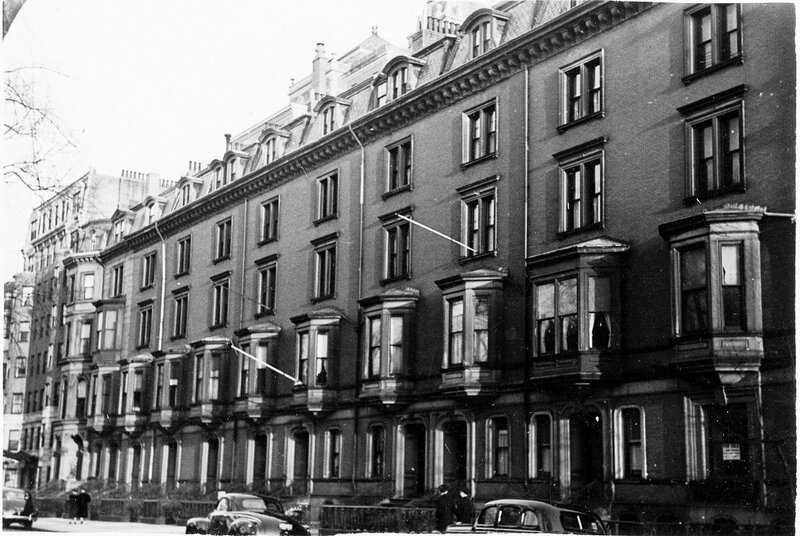 In April of 1945, they applied for (and subsequently received) permission to convert the house into six apartments. The Allens owned 30 Commonwealth for thirty-five years, first in their own name, then through the Thirty Commonwealth Trust (from 1949 to 1957), then through the Allen Trust (from 1957 to 1961), and then again in their own names. On January 17, 1979, they transferred the property into Eva Allen’s name. On April 25, 1979, real estate broker and developer Lili Banani, trustee of the Moshiri Company Trust, purchased 30 Commonwealth from Eva Allen. In January of 1979, prior to finalizing her purchase of 30 Commonwealth, Lili Banani had filed for (and subsequently received) permission to convert it into four apartments. 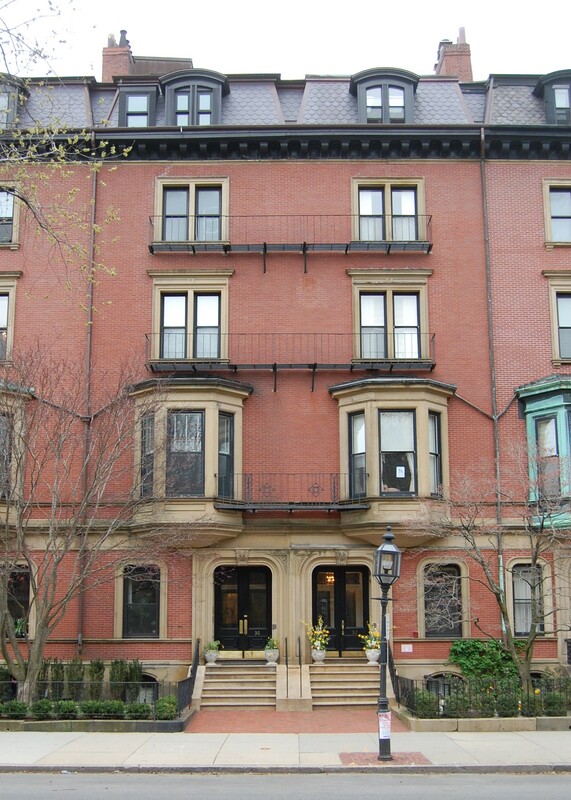 On August 3, 1979, she converted the apartments into four condominium units, the 30 Commonwealth Avenue Condominium.